Made by Hand is a personal project I’ve been working on since early 2013. This started as a DIY blog I created to document my personal crafting projects. I eventually created a few tutorials for sewing projects that gained a good bit of attention within the crafting community. In May of 2017, I made the decision to rebrand the blog to better reflect a modern and timeless design that can grow and evolve with the business plan. The Made by Hand brand is meant to persist through any business idea I choose to pursue. Made by Hand is about anything and everything handmade, so the seemingly generic business name is actually highly inclusive and expandable. What started as just a blog has been expanded into a full eCommerce shop for handmade goods, and In the future the brand will be applied to a brick & mortar retail store. To keep this fluid nature of the business, I simplified the overall design of the brand. Stripping it down to a black and white base allowed me to develop a timeless design that can be molded as the business grows. The text based logo does not rely on a volatile symbol that can become dated or attached to a specific business type. Over time, if the font becomes outdated, it can be adjusted to a new font for an easy transition into a new logo design. The brand truly starts to shine through with the use of photography. With an ever-changing business model, the images I take of the projects I’m working on will be ever-changing as well. By keeping the brand simple, any style or subject matter in the photography will fit in and begin to mold the brand into whatever new form suits the direction the business is heading. I also created a smaller, icon logo to use for brand recognition when I sell my handmade items. This small icon will be used on product hang tags as well as garment tags on the items themselves. Left: The Made by Hand text-based logo. Right: The small icon logo used in branding materials. The handmade community of makers and artisans is as vast as it is diverse. Many crafters are self taught, and spend time scouring social media for inspiration and information about their next project. Social media is a major part of marketing a creative business, and I’ve taken the time to learn everything I can about how each platform is beneficial to the Made by Hand project. Using Facebook to promote my blog is important because of the potential audience. Facebook is one of the largest sites on the web and has a much more diverse user base than many other outlets. I use Facebook to promote new blog posts, advertise new shop products, and to network with other makers within the community. Instagram is the largest social platform that I use to promote the Made by Hand blog and products. Instagram is a very personal social outlet where users can connect on a deeper level than most other platforms. The image-based system of posting allows users to share more visually immersive content than they can on other sites. The photos are the forefront of every post, and they are often the only piece of the post that’s consumed by viewers. Because most viewers look mainly to the photo, there is a higher standard for the image quality and composition. Accounts that use more creative, well composed, unique photography are much more likely to stand out amongst the crowds. Using my own background in photography, I’ve been able to make Made by Hand stand out amongst many other accounts within the maker community. Sharing photos that feel more candid and “behind the scenes” has allowed me to connect with my followers on a more personal level and network with other creatives to further my business. Pinterest is an essential discovery outlet for many makers. I use Pinterest myself to discover new project ideas, patterns, and instructions. It’s important to also include my own content within the Pinterest content pool, so that other makers can find my blog posts that often include tutorials and tips for crafting. The Made by Hand website is equipped with a custom WooCommerce installation and theme that I designed and coded. I wanted to keep the shop simple and easy to navigate, so minimal changes were made to the base WooCommerce layout. Like many crafters, I attend craft shows to sell my handmade goods and services alongside my online shop. Carrying the brand identity into and in-person scenario was a very important goal for me to achieve when I signed up for my first show. Since my branding is mainly black and white, I allowed that neutral base to carry over into the table, display, and signage. 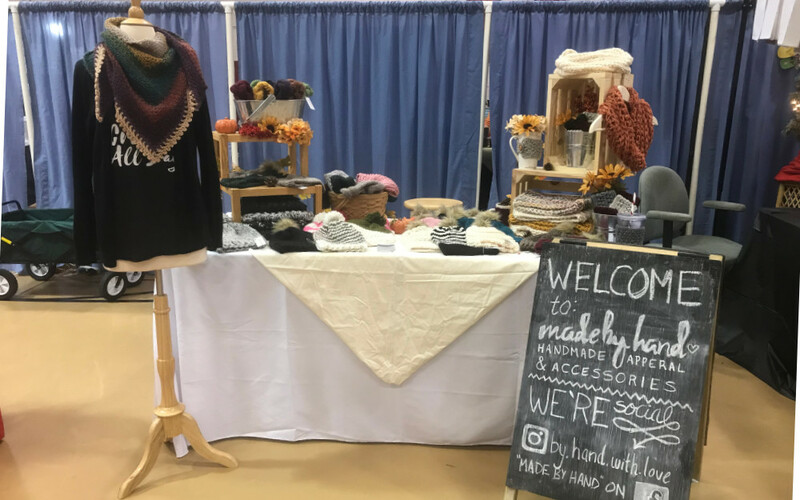 Using white tablecloths and black chalkboard signs, I was able to use other styles of decor to make the booth look more inviting and appealing to the crowd that attended the show. The decor I use at each show can very easily be altered and still fit within the Made by Hand brand. In the future, I hope to apply this visual merchandising concept to a full brick & mortar retail shop for handmade goods. The boutique would sport the Made by Hand brand to sell handmade clothing, accessories, and home decor. This ongoing project will continue to grow and evolve as I continue to create more handmade items. The need for graphic design within the business is always changing, and I have many opportunities to explore new projects and design experiences. From packaging to online ads, there is so much to learn from working on such an in-depth branding project.